Hey Minnow, Wanna Be Adopted? Details Inside! It all started last week. The idea was adopting one minnow and I ended adopting 2! Last Monday I adopted @claudiaz and @pardinus and today the #adoptme process its open again! I will adopt 2 minnows weekly from now on! Once a week I will pick 2 minnows and I'm going to adopt them. I will upvote at 15%, up to 2 posts per day of my adopted minnows and I will resteem 1 of their post per day for exactly 7 days. This is to help minnows grow in this platform. I would like to see people doing the same, if we all adopt someone we can all grow together! Once a week I will make a post to pick 2 new minnows. How to get picked? Easy just write in the comments below "ADOPT ME!" Easy, right? 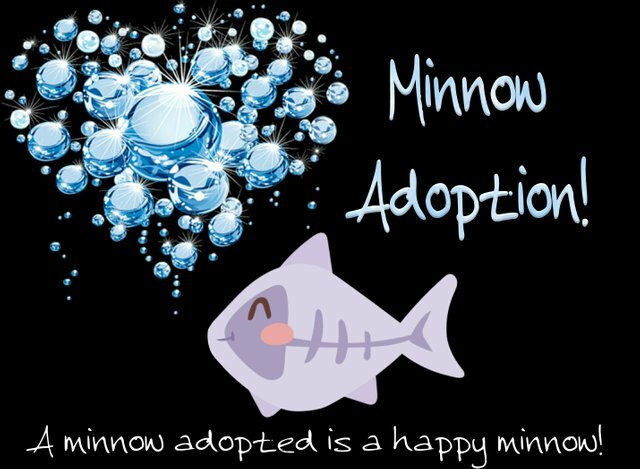 So if you're a minnow, post original content and don't fill Steemit with spam crap then you can be adopted! I will check the profiles of all the people who apply and announce the people I adopted in a post every Monday. The minnows will get 7 days of upvotes and resteems! I will use the hashtag #adoptme for the adoption applying post and the adopted minnow post. Alright, let's do this! Go and write Adopt Me! in the comments below and good luck! If any other person wants to join me in this adoption madness feel free to use the #adoptme hashtag and tag me in your post! Also, resteem this, so all your friends can apply for adoption! Thanks! If everyone help each other we all can grow! Well done, congratulations to the adopted! Hmmm... I just got a wonderful idea, maybe you wanna help in my new madness? It was a pleasure to be adopted! :P Thanks again for the initiative, it's another proof of how great the steemit community spirit is! thank you so much for the support you gave me last week, it was very nice being adopted! please can you keep me, lol. Seriously though, thank you so much this is a really great idea! thank you for your support I will! Two weeks in a row! Great, my dear Lúz! Good luck to all! resteemed! Great idea, thanks for your posts that give us visibility, great job.